​a state-wide certification program for anyone who wants to learn more about Tennessee's great nature! Become a certified Tennessee Naturalist! Since 2011, the Friends have offered its members the opportunity to become certified as Tennessee Naturalists by completing a series of ten classes, and completing 40 hours of service to environmentally-focused organizations. Registration for the Tennessee Naturalist Program (TNP) program begins each June. The ten, four-hour sessions run from September to May with meetings averaging once a month, usually on Saturday mornings. The classwork is divided between lectures, hands-on activities and many hours of outdoor immersion. Topics include local geology, forests, animals, plants, fungi, aquatic biology and astronomy. The fieldwork portion of the course can be physically demanding with hikes on steep hills and rough terrain and some night activities. See photos from some of our Tennessee Naturalist classes, here. Among those who serve as volunteer instructors are TN State Naturalist Randy Hedgepath; Sewanee professors Bran Potter, Ken Smith and Kirk Zigler; Sewanee Herbarium Curators Mary Priestley and Yolande Gottfried; TWRA rehabilitator Margaret Matens; and State Park Rangers Jessie McNeel, Jason Reynolds, Philip Hylen and Mark Taylor, and former St. Andrews-Sewanee instructor Ron Ramsey. This outstanding group of educators and naturalists makes each session lively and memorable. The TNP is an education training course designed to introduce the natural history of Tennessee to interested adults, with chapters across the state. Graduates join a critical corps of volunteers providing nature education, outreach, and service to the park. The cost of the course is $250 per person if you are a current Friends member. Non-members may participate for $275, which includes a year's membership in the Friends. Participants receive a field notebook, hand lens, and a jump drive containing all class materials. Registration is on a first-come, first-served basis. The 2018-2019 Tennessee Naturalist Class is now full; however, you may click the button below and enter your info to get on a wait-list, in case there are any cancellations; and to be notified when registration will open for the 2019-2020 class next year! Get on the Wait List for the TN Naturalist Pgm! Meet the Tennessee Naturalist Program’s South Cumberland Class of 2019! The class series began its 7th year on September 8th as part of the Friends' Education and Outreach initiative. This year, the Friends' offering of the Tennessee Naturalist Program is being ably led by Todd Wright, with help from Ken Beerman. • Certified Wildlife Rehabilitators ...and more! Todd Wright or Ken Beerman. Recent graduates of the South Cumberland class of Tennessee Naturalists. 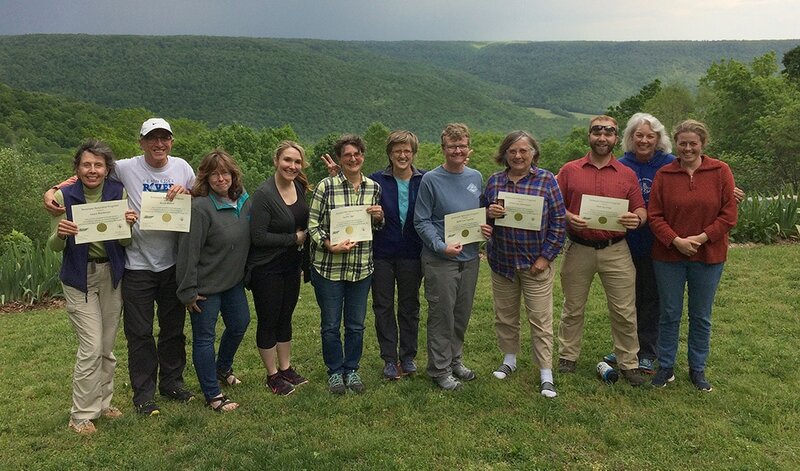 Congratulations to our Tennessee Naturalist Class of 2018, which recently completed its coursework. Many of these folks are only a few hours away from finishing their 40 hours of service and receiving their official Tennessee Naturalist certifications. The Friends are looking forward to the continued involvement of these naturalists in our upcoming programs and initiatives in support of the Park!